A large Sunflower Sea Star, Pycnopodia helianthodes, on a vertical rock wall in the Salish Sea. Some possibly mythical measurements had to growing to over 1.5 m (5 feet). Sometimes the news one subscribes to, or suffers through (even though I refuse to listen the giant Cheeto in the White House) kicks one right where it hurts the most… in the mind and memories. 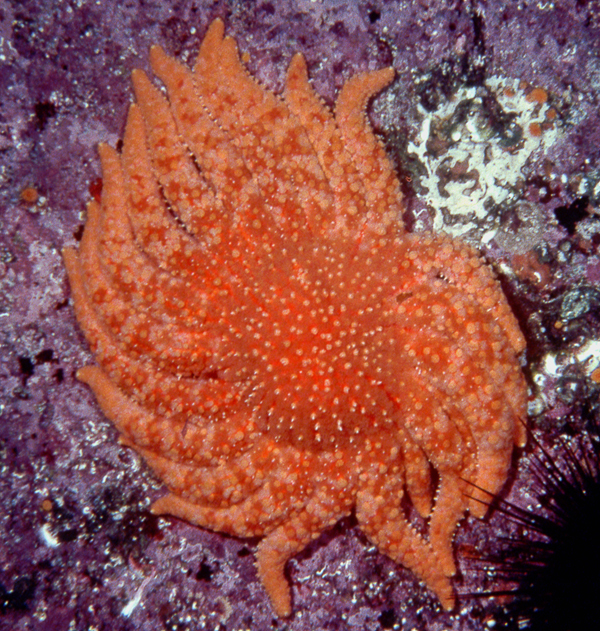 Here’s a recent example, in which a new publication confirms the extirpation and possible extinction of the benthic ecosystem apex predator, the Sunflower Sea Star, Pycnopodia helianthoides, due the combined effects of abnormally warm sea water temperatures coupled with the effects of sea star wasting disease. I made my last scuba dive 25 years ago, nonetheless, I have still made more than enough dives to average over 30 dives a year for the last 50, or so, years. One category of persistent, fond, and lasting, memories concerns sea stars and their behavior. Of course, as I am very interested in predator-prey interactions in general, and as pretty much every sea star preys on something, my mental file cabinets in the sea star memory room are filled to well over flowing. And, having the Northeastern Pacific as the general site of most of my diving, I have a lot of memories of the wonderfully large Sunflower Star, Pycnopodia helianthoides, by some estimates and measures, the largest sea star known. Some early, and possibly mythical measurements of its diameter were over 1.5 m (about 5 feet). In some areas I where I did a bit of research, this species was both surprisingly abundant as well as being very large. For several years, I was fortunate enough to be asked to teach a total-immersion course (6 weeks long, 10 university credits for it) in Marine Invertebrate Zoology at what then was called the Bamfield Marine Station, supposedly one of Canada’s premiere marine-oriented labs. It is now named the Bamfield Marine Sciences Centre. A class like mine or some of the others taught there is very dependent upon serendipity. The laboratory is right on an inlet which opens to the wide Pacific just a few miles away, and with lucky onshore winds, we often had strange and bizarre creatures blown into the inlet. Every day, the teaching assistant and a couple of the students were out gathering plankton and other animals for the class to examine. Often strange critters were collected or seen or wonderful instances of invertebrate behavior could be observed. A couple of weeks before the class was over in 1982, a rather large group of squids ( = The Pacific Market Squid or, Doryteuthis ( = Loligo) opalescens ) entered the large fjord system, Barkley Sound on the Southwest edge of Vancouver Island, British Columbia, where the teaching facility was located. And if I remember correctly, the estimated number of squids was a bit over 64,000,000 animals, and they all got “The URGE” one night. The story of that event is given in detail in my personal blog. I was down on one of the facility’s docks when I saw some squids having some pre-spawning behavior one afternoon, I asked a few of my students if they would be interested in doing some work that night and afterward over the next couple of weeks that might result in a published paper. A few said yes, we started work that night, and it eventually did lead to a paper co-authored by me, the class teaching assistant, and several students. Now… Finally, I get to the point… During the surveys of the squid egg masses, we found the average Pycnopodia helianthoides density was 0.71 stars/10 sq m over a surveyed area of 1 ha =10,000 square meters, or a total of 710 stars. Each diver surveyed 5 to 10 band transects each of 100 square meters. The stars had an average maximum diameter of 0.81 m (about 2.66 ft or 31.89 inches). Although the abundance and size data in the spawning area was high, none of us who had done a lot of diving in the area considered either metric abnormally high. In other words, in 1982, around the Brady Beach area on the north shore of the Mills peninsula, facing on Trevor Channel, just south of the opening to the Bamfield Inlet home of the Bamfield Marine Sciences Centre, the apex predator of the bottom fauna (both infauna and epifauna), Pycnopodia helianthoides, averaged about 71 individuals seen in each of the 100 square meter surveyed areas, and these sea stars had an average diameter of 0.81 m, or 2.66 feet = 31.9 inches. I lived at this facility for two years when I was the Assistant Director, during that period and over the next 20 years I did some research diving, as well as diving to collect animals for my class when I taught the marine invertebrate class again at sporadic intervals eight more times, until 2003. I did not see any appreciable change in the abundance or individual maximum size of this particular sea star species. However, subsequent to my final teaching residence at the station in 2003, a period of warming in 2013 facilitated the virus which apparently caused the rapid death of virtually all sea stars from about 20 species in the region, but it specifically seemed to be particularly lethal to the flexible Sunflower Star. Many scientists collaborated collecting data from 2006 to 2017, and the subsequent analyses resulted in a paper published in January, 2019. linked to here and cited below. epidemic and a marine heat wave are associated with the continental-scale collapse of a pivotal predator (Pycnopodia helianthoides). Sci. Adv. 5, eaau7042 (2019). The authors used the extensive data set resulting from their collaboration to definitively showed 80 to 100% declines in Pycnopodia helianthoides populations across a ~3000-km range from California to Alaska. The scientists used data from shallow nearshore waters collected from 10,956 dedicated diver surveys done in 2006–2017, as well as data from offshore and deep areas collected using 8,968 trawls in depths ranging from 55 to 1280 m (180 to 4200 feet). Red sea urchins about 25 cm (10 in) in diameter, consuming a Nereocystis kelp they have pulled down to the bottom. essentially wiping out any leafy algae as well as sessile invertebrates leaving only “sea urchin barrens” in some of these areas. 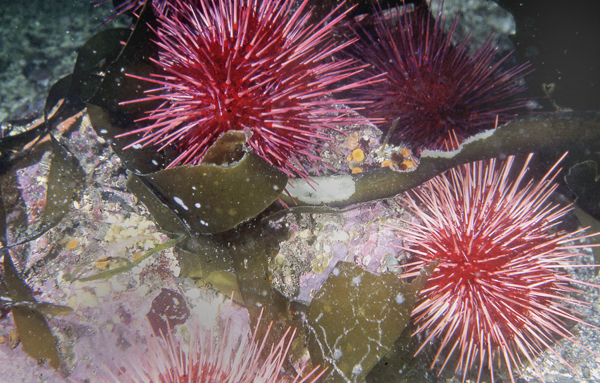 Sea urchin barrens are areas barren of all visible life with the exception of many common sea urchins and crustose coralline red algae. What will occur along the coast is anybody’s guess, but this region, the Oregonian Biome was one of richest temperate marine areas in terms of biodiversity, and THAT is sure to change.